Sweet potatoes are different than yams and each brings a different flavor and level of sweetness. Sweet potatoes comes in many varieties. This recipe is ultra simple, so it'll give you extra time to focus on other dishes for your meal. Wash the yams and sweet potatoes. Fill cold water in a pot until it barely touches the steamer level. Place the potatoes, bring to a boil then reduce the heat to a medium high. Steam for about 20 minutes. The potatoes should be fork-tender. Remove from the steamer. Let it cool down. Peel the potatoes. Place them in a oiled baking tray. In a bowl, mix the butter, mandarin juice and 2 tablespoons of molasses. Drizzle with the butter/molasses mixture. Sprinkle salt and pepper. Remove the thyme leaves from the stem, then sprinkle all the dish. Drizzle some olive oil if the potatoes are not entirely coated. Bake for about 20 minutes. When there's a nice brown crust, your potatoes are ready! Transfer to a nice serving platter, garnish with sprigs of red creeping thyme and drizzle with the molasses-balsamic syrup. To remove thyme leaves from the stem, hold the top of the stem with one hand and the other slides through the stem and pulls the leaves off. Bruise the leaves a little in a mortar and pestle to release all the flavor. Jacqueline is a self-taught home cook based in the San Francisco Bay Area. She is French-Vietnamese, born and raised in Paris, France. Her husband Lulu and his family.are from India, so their home is a melting pot of cultures and cuisines. Note that this recipe is described by many cooks as very very sweet, like a dessert. Lee suggests using a LOT less sugar. 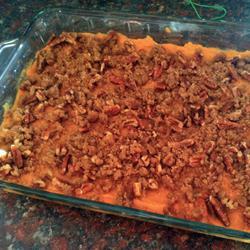 Source: All Recipes "Yummy Sweet Potato Casserole" by Tina B. Heat a large Cephalon frying pan (or similar ovenproof pan) and add some olive oil. Add the sweet potatoe and butternut squash chunks and stir to cover. Spread out in one layer in the pan and put into a 350 degree oven. Let roast until done. Sprinkle on the fresh herbs. Add other parts of the dinner, scuh as the boiled potatoes and green vegetable and cooked salmon to the pan and put in a low oven and let heat for a short while. Sprinkle with some fresh herbs like parsley and chives and serve. Skin the filet then dry with a paper towel. Dust the filet with a small amount of the rub. Heat a small amount of oil in a fry pan and brown the filet on both sides. Then let cook on moderate heat until almost done. Transfer to oven proof pan which has the sweet potatoes and the other vegetables in the oven. Let heat at low heat for about 5 minutes. This sweet potato casserole includes diced apples, brown sugar, and cider. It's a flavorful sweet potato casserole, and delicious with ham or pork chops. Cook sweet potatoes, peel and slice. Melt butter in saucepan and cook apples until tender. Add the sweet potato slices and use potato masher to make apples and potatoes smooth. Stir in cider and brown sugar and salt and pepper. Heat over low heat until steaming hot. This cooking method brings out the deep, earthy sweetness of sweet potatoes and produces a silky puree with enough body to hold its shape while sitting on a fork. 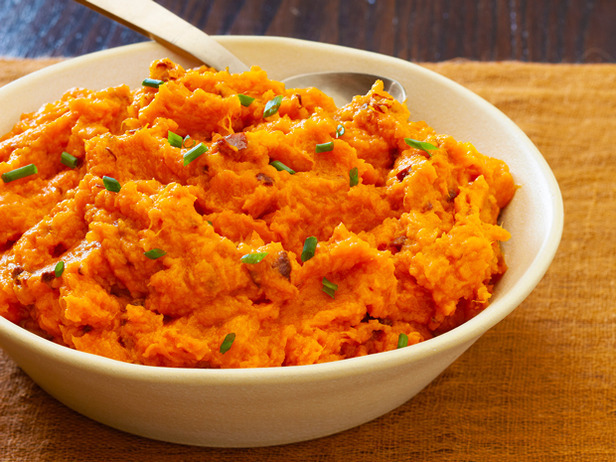 Braising in a mixture of butter and heavy cream gives mashed sweet potatoes richness. Adding salt brought out their delicate flavor, and just a teaspoon of sugar bolstered their sweetness. 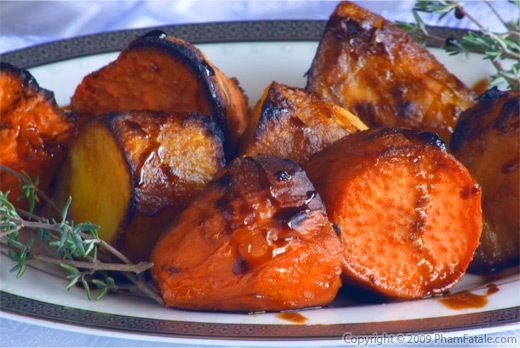 Cutting the sweet potatoes into slices of even thickness is important in getting them to cook at the same rate. 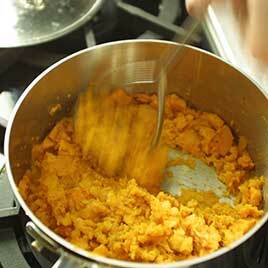 A potato masher will yield slightly lumpy sweet potatoes; a food mill will make a perfectly smooth puree. The potatoes are best served immediately; but they can be covered tightly with plastic wrap and kept relatively hot for 30 minutes. This recipe can be doubled in a Dutch oven; the cooking time will need to be doubled as well. Braise the sweet potatoes in a mixture of butter and heavy cream. Add salt to bring out the sweet potato's delicate flavor and just a teaspoon of sugar to bolster its sweetness. When the potatoes are tender, mash them in the saucepan with a potato masher. Melt butter in a large saucepan over low heat. Stir in the cream, sugar, and salt; add the sweet potatoes and cook covered, stirring occasionally until the potatoes fall apart when poked with a fork, 35 to 40 minutes. Off the heat, mash the sweet potatoes in the saucepan with a potato masher or transfer the mixture to a food mill and process into a warm serving bowl. Best served immediately, but they can be covered tightly with plastic wrap and kept warm for 30 minutes. This recipe can be double and prepared in a Dutch oven; the cooking time will need to be doubled as well. Note: Alton Brown did a really easy recipe with mashed sweet potatoes, butter and chile en adobo. See "Chipotle Smashed Sweet Potatoes"
Put cubed potatoes into steamer basket and place steamer into a large pot of simmering water that is no closer than 2 inches from the bottom of basket. Allow to steam for 20 minutes or until the potatoes are fork tender. Add butter to potatoes and mash with potato masher. Add peppers, sauce, and salt and continue mashing to combine. Source: Alton Brown TV Show: Good Eats Episode: Potato, My Sweet "Chipotle Smashed Sweet Potatoes"